Rollins Sprinkler & Landscaping, established in 1995 by Quentin L Rollins, is a professional landscape construction company. The company continues to be owned and operated by the founder, a homegrown native of Utah, and managed by longstanding operational managers. Within the first five years Rollins was working with just about 10 employees and has now grown to 25-30 committed employees. Based in Sandy, Utah, Rollins Landscaping has performed 1200+ jobs throughout Utah, Wyoming, and Nevada. Their extensive experience and longevity in the local area and in the industry have afforded them vast technical expertise, reliable manpower, a substantial professional network, and an accumulation of equipment necessary to competently accomplish landscaping, stabilization, and sprinkler installation projects of any size and complexity. Of all the jobs Rollins Landscaping has completed over the past 20 years we focus on a variety of different projects involving residential, educational, religious, government facilities, retail establishments, parks, and improvements and restorations. Some of our monumental jobs include Daybreak Homes whom we have worked with since 2008 and continue to work with today, Draper Park Middle School, Intermountain Riverton Hospital which was completed summer of 2015, and plans to complete Cache County High School in 2017 along with various other projects. 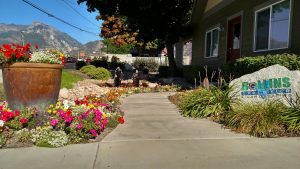 Our goal is to make sure our customers are 100% satisfied with the landscape and irrigation work in which they receive. We strive to provide only the highest quality of Landscape Construction and Irrigation Systems possible with the highest quality of professionalism. We pride ourselves on our energy and enthusiasm. Rollins Landscaping looks forward to future opportunities for growth with great excitement. With the organization of the staff and procedures we have in place there is no limit to the possibilities of the future for Rollins Landscaping.